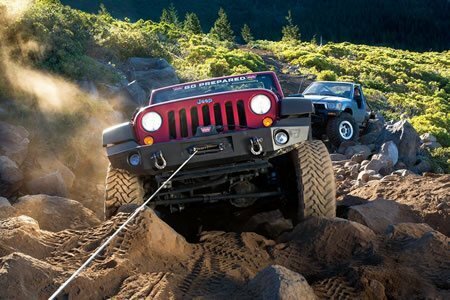 You can never tell what your 4×4 or jeep can do until you have pushed it beyond its limits, and having a winch at that point is going to be helpful for any off-road vehicle. Experimentation is the only way you can know the kind of mud that can be handled by your customized vehicle because there is no definitive guide. And you can test its limits properly only when it gets stuck for real a couple of times. This is why you need the best quality winch you can afford. There are so many models of electric winch available, each having their own tolerances, weakness and strengths. To try to help you find the perfect winch for your needs, we have reviewed three truck winch models that we feel are the best in the market right now. These three will give you your money’s worth. Our favorite is the Smittybilt 97495 because it has the perfect combination of price and features, making it an awesome choice for pretty much any requirement. The other two winches also excel in so many areas, so finding your perfect one will depend on your specific needs. Read on and we will tell you why these three winches stand out from the sea of competitors. What Is The Size Of Winch I Need? How Many Times Will You Use Your Winch? How And Where Will You Use The Winch? How Ratings for Winches Work? Is Synthetic Rope Better vs Steel Cable? Do I Need A Winch Mounting Plate? Do winches require repairs and maintenance? 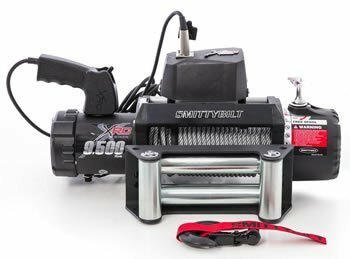 The Smittybilt winch 97495 XRC is our top electric winch pick for the money. This is a powerful rugged winch with a pull strength measuring 9500 pounds. This will be strong enough to pull your truck or Jeep Wrangler out of the mud, if you venture a little too deep! The 97495 XRC has a motor that is amphibious with a massive horsepower of 6.6 and a planetary system of gear that transforms that 6.6 horsepower into sheer strength for pulling. Did we also mention the fact that it is waterproof? AKA amphibious? You are going to need this in any quality winch because mud holes always have water in them. This explains why the design of Smittybilt XRC encloses both a gear system as well as a motor to keep the water out and your own hopes of finally getting out from the mud irrespective of how deep your jeep or truck sinks. With the XRC’s corded remote, you will now be able to operate the winch without worrying about the water situation. The Smittybilt winch reviews on Amazon currently has more than 300 x 5 star and 4 star reviews. So you can see why it is rated as one of the best selling winch models. Most of the users have lauded the superb pull capacity of the 97495 XRC and there are also comments from many people about the straightforward installation of the winch. A good number of buyers have given testimonials on how this winch has saved them from muddy and sticky situations. Given all of the above, there are still some great competitors to the Smittybilt 97495 but one major factor that has made this our favorite top ranking winch, is its price. You can pickup this great performing off-road accessory at just under $300. At such a low price, you have no excuse not to buy this Smittybilt for your 4×4 or jeep. A great set of features has propelled this Superwinch LP8500 Gen II into the coveted number 2 spot in our list of ‘best truck winch’ for your money guide. You can easily tell a lot of creativity has gone into making this winch, which boasts a pull strength of 8500. Features like the three stage heavy duty all metal gear train enhance the performance of the 4.5 horse powered wound motor. The pulling power may be a little less than our Smittybilt 97495 number 1 choice but it still has a lot of pull to get your jeep out from the mud and back to having fun. There are other features that you will love about the LP8500 once you start using it. You will get plenty of extra rope to fasten onto something with 94 feet of 5/16 inches steel rope cable at your disposal. Since you have a 15 foot cable for the winches hand held remote, you will also no longer need to stand in water while you watch this super winch work its magic. Which is always a plus! 85% of people who reviewed the SP8500 gave this winch either a 4 or 5 star rating. That percentage equals over 100 people who have taken the time out to review this product. A recurring theme that has occurred over and over again in most of the reviews is its easy installation. This is a bonus because most of us who love to mess around in the mud are sadly not professional mechanics. 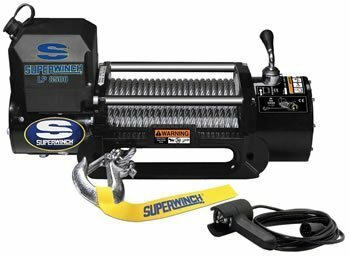 The Superwinch LP8500 Gen II also has a great price like our number 1 winner. The LP8500 is a great choice if you want a reliable entry level electrically operated winch with certain features which don’t usually pop up unless you pay more. Overall, this is a great, affordable winch, I personally would be happy with, any day of the week. 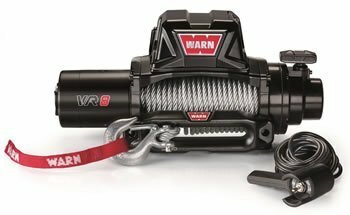 The number 3 spot for our best winch for the money guide is none other than the WARN 86244 VR8000. Warn has become synonymous with top quality winches so finding this in a value round up is not surprising at all. The features you will find in the VR8000 makes it a great pick for entry level winches needed for SUVs, Jeeps and light trucks. The pulling power of the VR800 at 8000 pounds is probably the least compared to the three competitors mentioned in this review. However, it still gives you enough grunt for your light SUV or jeep to get them out of a mud hole. Just like our number 2 choice, the Superwinch, the VR8000 Warn has a cable length of 94 feet and a 3 stage planetary gear train. You can also keep your feet dry with the corded remote although the remote cable in this one is shorter than the Superwinch by 3 feet. Another feature that we love about this VR800 is the control pack that can be removed. You can remove it and mount somewhere else in your vehicle. With this, you can control the unit from any place you want. The VR8000 also has a proprietary rope, made from synthetic Spydura, just like the other higher end units in Warn. The VR8000 has followed in the footsteps of our other top two picks and has generated a lot of positive feedback from the buyers. Most buyers are happy that they paid an affordable price for a quality winch. It may be a little more expensive than our top two picks but it is because Warn is a good brand and you pay for the name. Before you choose yourself a winch for your pickup truck, Jeep, SUV or 4×4, there are a couple of questions you need answers to. Keep reading to find out answers to frequently asked questions so you make the right choice for your vehicle. A very important question you need to ask when buying the best off road winch, is how much winch power does your jeep or truck need? The industry standard rule of thumb is actually to take the weight of your vehicle and multiply it by 1.5 to get a minimum rating. Realistically, however, a lot of factors come into play when considering the size for your particular setup. If you frequently use your winch, get a larger size. The more you make your winch work, the fast the wear out process will be. If you have a powerful winch, it will not stress itself as much to pull a lower load. It is alright to “max out” your every day winch some times but doing this on a daily basis will wear out your winch considerably faster. The heavy strain will wear out your winch faster than if you had bought a winch with more power. The winch power you need will be decided by the type of terrain you will drive on and how you usually use your winch. You will need more power to pull vehicles out of muddy holes as compared to simply using your winch to pull rolling loads on a stable and flat terrain. Sand and mud have high “sucking” power and consequently, you will need a higher winch power. If you are a heavy mudder, you will need winches that are at least 2x’s the overall weight of your jeep or truck. Do not forget that that steep inclines need to be taken into account. You will require higher winch power for steep grades. You will also need a larger sized winch for terrains like mountains, steep hills and pulling loads up ramps. You must get a winch that has both dynamic and mechanical braking if you want your winch line to hold the weight without straining under steep angles or heavy loads. You will find dynamic brakes on all winches. It is an automatically operated braking system in the drum. Some winches will also include the mechanical brake or the physical brake – the ones that are similar to your car brake. It is recommended to buy a winch with both mechanical and dynamic braking if you usually use the max capacity in your winch. You will usually max out on steep angles, with snow plow systems or under the weight of heavy loads. Using a mechanical brake will enable you to prevent slipping and hold the weight better. You can rate your recovery winch by the cable’s first layer (the one nearest to the drum). Measure the fullest capacity of the winch by spooling it out, leaving only a layer on the drum. If the cable is too short for the distance between the load that you are pulling and the recovery winch, then you will have to rig up another double line pull. This is an ongoing debate. Some people swear by synthetic winch rope because it is safe, light and strong. Others prefer to stick to the steel cable because it has a long history of durable off-roading. Both the synthetic and the steel ropes have their own share of weaknesses and strengths. Synthetic cables are more flexible and lighter than steel cables. It can float in water, will not slice your poor hands with from metal burrs and you can easily splice it. As for steel cables, it is low maintenance, retains the circular properties even under heavy tension so that you can neatly spool it and it has a long track record of reliable off-roading. Using a mounting plate is the most secure and the safest way for you to mount your winch. You can get either a custom mount plate or a universal mount plate for your vehicle. You can even get a multi purpose mount winch plate so that you can easily move it from the front to the rear end of your truck or 4×4. If you opt to not have a mounting plate at all, then you have to mount your winch on a secure and flat surface that can withstand the force of the pull from the winch. You can check the pricing for mounting winch plates on places like Amazon which have a great selection. Off road winches are low maintenance. You can prevent damage and corrosion from the elements by keeping it dry and clean with the help of a winch cover. Always check the winch for any signs of damage before and even after you use it. Before you re-spool it, you should clean the cable first and then let it dry out. Every few months, check if the mounting bolts and electrical connections are still tight and clean out any corrosion or dirt from the winch connections. The easiest way to perform these checks is to lift your vehicle with a car lift so you can easily get to the electrics underneath and check all connections. If you constantly expose your winch to harsh conditions than you will have to take it apart from time to time in order to clean it and then give it a good lubrication. Getting a really harsh grinding sound from the motor will give you the indication that you need to clean and service your winch, so don’t just ignore it, otherwise, you will be having to buy and fit another one!